This lesson uses water vapor satellite imagery from Himawari-8 to describe the typical extratropical transition of a tropical cyclone. The Himawari-8 imager previews comparable capabilities coming online with the GOES-R ABI imager. The lesson also provides a brief overview of subtropical cyclones and their transition to tropical cyclones. 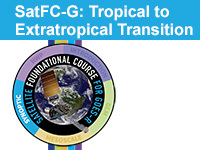 Describe the process of tropical to extratropical transition and the evolution as it appears on satellite imagery.